Qin Shi Huang's mausoleum is yet to be excavated. Do treasures await? Editor's note: CNN.com's David Challenger journeyed along a stretch of the Silk Road that is inside China. This is the third entry in a five-part travelogue recounting that journey. (CNN) -- Arriving early in the morning at a designated meeting spot near my hotel, I was happy to find only two other people -- a young British couple -- had joined the tour. Tourists check out one of the warriors within a glass casing in the Terracotta Warrior Museum. We took off in a mini-bus as our guide, Mr. Chi, explained some fundamental facts about Xian and its related history. First stop was the Banpo Neolithic Village, 10 kilometers (6 miles) east of the city, and its oldest gem. About 6,000 years ago, an ancient culture occupied this settlement, which was thought to have been highly matriarchal in its structure. A section of the site is excavated and now under cover, allowing participants a glimpse into the lives of these Stone Age people -- including displays of pottery, fishing hooks, axes and, chillingly, skeletons of children in large vases. Expertly, Mr. Chi herded us back on to the bus and we headed for one of the world's greatest archeological discoveries. If it weren't for some toiling farmers digging a well back in 1974, the famed Terracotta Warriors may remain buried still. One of the peasants, the elderly Yang Pei Yan, appears regularly at the Museum of Terracotta Warriors to sign books, and was doing so today. "Don't take his photo," Mr Chi exclaimed. "He hates his photo being taken!" True enough, Yang was sitting signing books bought by tourists with one hand, while the other held a fan that shielded his face from photographers. Despite the warnings by numerous tour guides, both Western and non-Western visitors snapped away at the former farmer, as he occasionally peaked over his fan and scowled. It was a comical situation; he's clearly unhappy with his celebrity role, though Mr. Chi said he was given a house and receives regular payments from the government for his duties. My British friends, having saved five years for their holiday, purchased an exorbitantly priced book on the warriors, and lined up for a Yang signature. When their turn arrived, Yang scribbled something inside the book's cover without once looking at the book, or them, then pushed it away as if were a plate of rotting offal. It was a priceless moment, and I later regretted not snapping a few photos of the cantankerous old man when I had the chance, fan and all. No amount of superlatives can describe the experience of walking through the three different vaults, which contain more than 7,000 terracotta soldiers and horses. Of the three structures, which were built to protect Emperor Qin Shi Huang's mausoleum about 2,200 years ago, I found vault No. 1 the most impressive. Resembling an aircraft hangar, this section can be viewed from a walkway a few meters above the 6,000-plus figures. We once again headed off with Mr. Chi, this time to visit the tomb of Qin Shi Huang, a few kilometers away. Essentially just a large hill, Qin Shi Huang's mausoleum is yet to be excavated due to fears it may be destroyed by the outside atmosphere. So it's not what you see, but what probably lies beneath, that enchants. 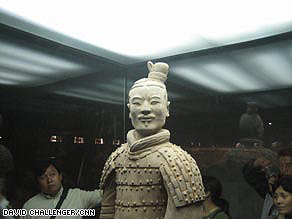 Some archeologists are convinced the tomb contains a myriad of treasures --- and possibly an even larger collection of terracotta warriors --- protected by ancient in-built defenses that might rival anything from an "Indiana Jones" film. Chinese historians believe Qin Shi Huang was the first leader to unify the country, who assumed the throne at the tender age of 13 in 246 BC. But while his legacy includes some admirable points (he standardized the country's currency, measurement system and written script), he remains a controversial figure in Chinese history. He was tyrannical to the last, having ordered all his mistresses and concubines (he never married) buried alive with him after he was entombed. The Banpo matriarchs would not have been impressed. I'd awoke on my final day in Xian with the knowledge that a 24-hour train trip began that night, so decided to stock up on some basic food items. On my forage, I walked past the entrance to the South Gate and noticed people clambering up its steps to walk along the city wall, so I followed suit. Before I knew it, I'd forked over 10 RMB ($1.30) for a rusty bicycle, and pedaled along the perimeter at a leisurely pace. The views of the city's inner and outer areas were brilliant. After passing numerous beacon towers and managing to avoid running down a bunch of elderly tai chi practitioners, I pulled over to take in the surrounds. The city boundaries stretched to the forever-gray horizon, where old housing rooftops contrasted with shiny new high-rise towers. In a park below me, residents exercised and gossiped, played badminton, and flew kites, while some of the younger generation powered up their Game Boys and listened to their iPods. The juxtaposition was evident, and, in contrast to its larger eastern sisters, comforting; Xian is a city unafraid of embracing its past as it heads toward its future.